The turn of the New Year is always a great time to think about your health, and small things that you can do to work towards a healthier you. I am just as guilty as anyone of not drinking enough water, so this challenge was the perfect opportunity to work on that! I know how important it is to keep hydrated—it’s good for your skin, your hair, it helps with sleep, and overall makes you feel better. So why is it so hard to consume the recommended amount of water each day? I know that for me, I am guilty of sipping on coffee all day long at work, which makes it harder to drink water. One solution I came up with to help boost my water consumption was cutting myself off from coffee at a certain time each morning. That left the rest of the day to get in my 64 ounces of water. Also, having a water bottle or cup pre-measured helps keep track of your daily intake. 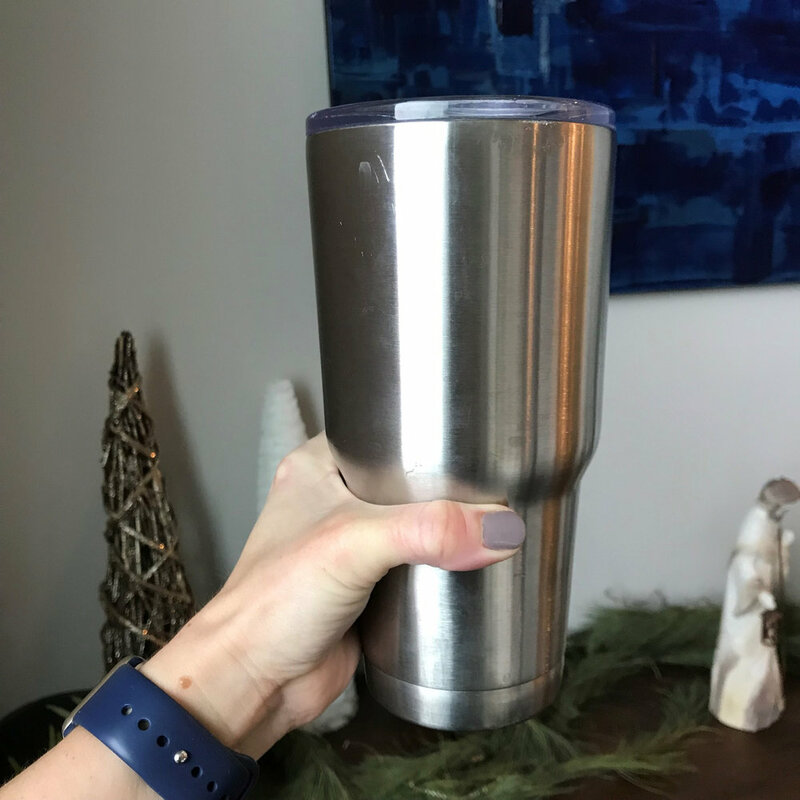 My cup, if filled to the brim, holds 32 ounces of water; so two of those a day and I am set! One of the main complaints I hear from people when they up their water intake is that they are constantly running to the restroom. I noticed this while I was pregnant and drinking TONS of water. A health podcast that I listen to regularly suggested adding a pinch of salt to your water bottle to help with absorption. I don’t have any data to prove this true, but whether it’s mental or not, I think it works! Was chugging water in bed to get it all in. Felt pretty full all day. Did a little better pacing myself, but still had to gulp down right before bed. Still felt pretty full and water logged. Got all of my water in with time to spare. Possibly all in my head, but I feel like my skin looks better. Cutting myself off from coffee at a certain time in the morning has really helped with my pacing. Last day, and feeling good! Lips and skin feel hydrated, and I don’t wake up thirsty in the morning. Does La Croix count towards our water tally? If so, I am wayyy over!